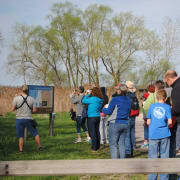 Thank you for your interest in helping to protect and preserve nature on our spectacular preserves all over Ohio. Our volunteer projects are centered on nature preserve management and ecological restoration activities - both of which are critical components of TNC’s work and mission. We need your help and we want you to be part of our conservation community in your area. Participating in projects will give you the opportunity to make a direct positive impact on the environment and meet people who have similar environmental passions. We need your help at our fairly new Great Egret Marsh Preserve in Marblehead with biological monitoring, trash clean ups, and invasive species removal. If you have interest in assisting with any of these activities, please contact Volunteer Coordinator Angie Burke at angela.burke@tnc.org or Conservation Coordinator Alexis Sakas at alexis.sakas@tnc.org or by phone at 419-627-7570.